Funerals - Evansville Limo . 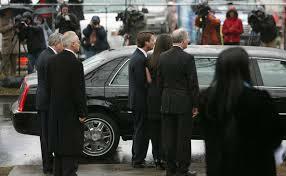 Need limousine transportation for family members at a funeral? Funerals are one of those subjects that no one ever wants to talk about, but is normally an inevitable consequence of living. Here at Evansville Limo Service we understand that during this time you have a lot on your mind. Typically the best way to handle funeral transportation is to coordinate it with the funeral home. If you wish to do this yourself, our friendly and knowledgeable staff will work with you and the funeral home to get all of your transportation need handled quickly and efficiently. You will have peace of mind in knowing that Evansville Limo Service will make your funeral transportation worry free. After all you will have enough on your mind. "Leave The Driving To Us". We will provide you and your family with the newest, most comfortable and spacious limousines available anywhere, and because we understand that funerals can be costly, you can rest assured that we have the most affordable limo packages in the Evansville area, and beyond. So if you are concerned with how you will get all of your family to and from the church, or funeral home to the cemetery, the reception and back home again. Give us a call today and let us set your mind at ease. Allow our family to care of the transportation needs of your family. You will be glad you did. Call us today for a free no hassle affordable quote. When buying floral arrangements for funerals, ask the florist which flowers are in season. Just because they show you a book with all the floral arrangement they have, does not mean that you have to have that exact same arrangement. Ask the florist if they can substitute those flowers for flowers that are in season. To make arrangements less expensive ask the florist to substitute less expensive flowers. Florist are in the business to sell you flowers, trust me they will work with you. Feel free to contact us 24/7 for your funeral transportation needs. We will be honored to assist you. Call us today.